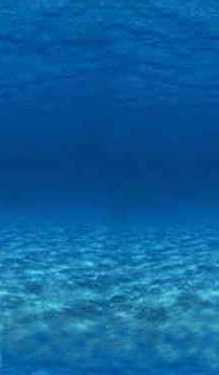 Dory is swimming along and she sees a beautiful yellow and black striped fish. 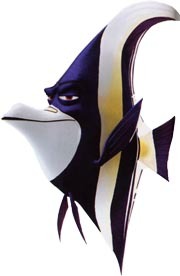 It is Gill from the first movie, only a closeup on his fin reveals that he has no injury. (If you'll recall, he hurt his fin in one of his escape attempts). 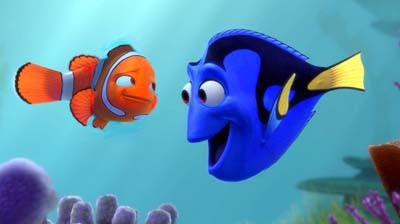 Dory asks Gill what kind of fish he is. He tells her he is a Moorish Idol. He tells her how wonderful it is being a Moorish Idol, how he loves exploring. He doesn't like spending too much time in one place, there's too much to see in the great big ocean. Gill is a free spirit. The musical number, "Big Blue World," teaches Dory about the exciting beautiful wonders she can experience in the ocean. Dory decides she'd like to be a Moorish Idol. She monologues about how she would like to explore and be a free spirit like Gill. 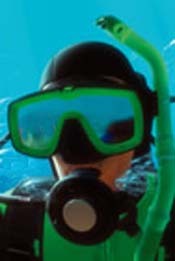 With Dory in the foreground, we see Gill in the backround and a familiar diver wearing a familiar green mask sneaks up from behind and scoops Gill up. We then hear a boat engine which distracts Dory. "What's that?" She turns around and notices Gill is gone. "Hey, where'd you go? "HELLOOOOO?" She looks visibly upset. A pretty clownfish that we recognize as Coral swims by and sees that Dory is distressed. Coral: "Can I help you?" Dory: "Oh, where is he?" Coral: "Who are you looking for?" Dory: "I don't remember! Was I looking for you?"